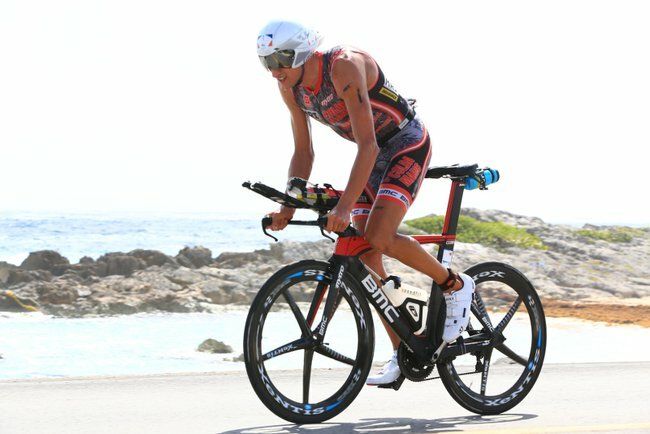 Firstly, it is worth pointing out that bike set up was almost identical YOY with Michi continuing to ride a TT bike frame, this year it was the BMC TimeMachine 01, together with the same wheel choice (Xentis Mark 2 TT Clinchers front and rear), aero helmet and shoes by Giro, hydration system (Speedfil) and low friction drive train coating (Atomic High Performance). Secondly, environmental conditions in Cozumel were also very similar YOY with mean temperature on the bike around 26-27C with similar wind speeds and direction. In 2013 the swim course was shortened slightly due to wave chop which meant the athletes simply swam slightly faster over the shorter distance. Not something that would have unduly affected the comparison in subsequent cycling performance over an entire Ironman distance. All in all, the two races make for an excellent comparison in terms of the pure performance capability of a world class endurance athlete in the prime of his career. 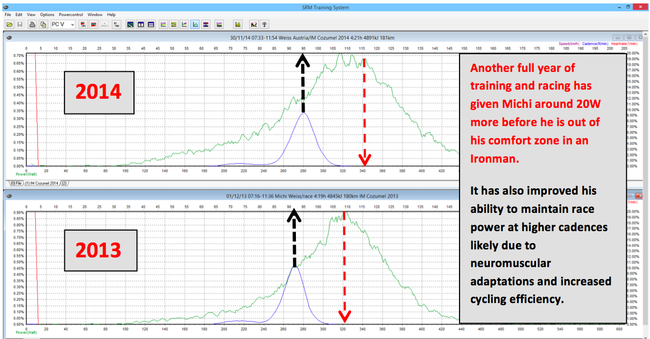 Thanks to SRM power and software we are afforded a level of performance insight which coaches, sports scientists and physiologists of yesteryear could barely imagine. 50km mark where in order to catch and drop the main bunch not only did Michi average 340W for the first 50km but then produced a 400W punch for 4 minutes, hitting and holding a speed of over 50km/h which is what it took to unhitch the bunch from his draft. It was not by chance that Michi attacked when he did – wind behind on the approach into town where the route becomes significantly more technical with numerous tight bends and contested racing lines it thus becomes harder for the bunch to work effectively together. Also wind behind will always favour the stronger cyclist due to the ability to produce high power at high cadences which is required when reaching speeds in excess of 50 km/h – Michi’s mountain bike pedigree is the gift that just keeps giving! As for the rest of the bike leg, execution looks straightforward on a graph but the reality is that the athlete needs to be especially attentive to consistent and appropriate nutritional intake (Snickers bars are a Weiss favourite, believe it or not!) over the second half whilst carefully managing power output in relation to individual proven (in training) ability. 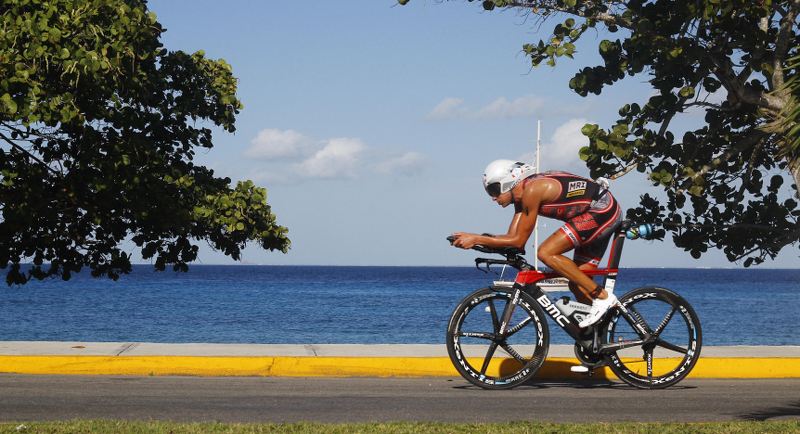 Michi always does this extremely well which optimises his subsequent running performance. That said he did experience some right VMO muscular issues in the latter stages of the bike leg which we will look into, but the point is that every athlete will feel ‘off’ at some point(s) in an Ironman and must not lose heart. It happens to the best! 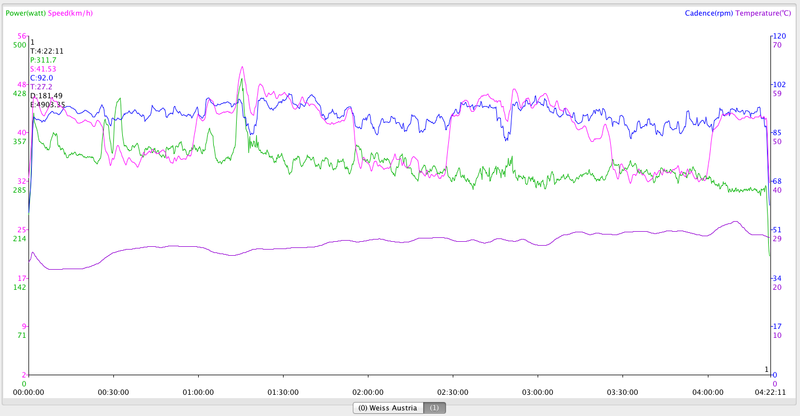 SRM software has a graphical ‘frequency’ option which can provide a nice comparison function between different rides showing where the athlete is ‘comfortable’ spending his time in relation to power, speed, cadence etc. 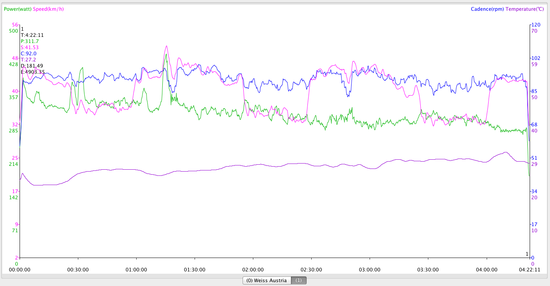 The frequency chart below compares Michi’s Cozumel bike legs in just such a way. We can see that although the rides are almost identical, there are some subtle differences. 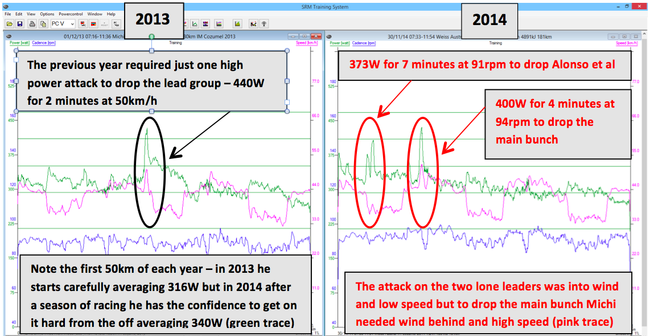 In 2014 If we look at the point where the green line (power frequency) suddenly drops away we can see that this occurs at around 340W vs. 320W in 2013. This tells me that this year Michi had around 20W more power available before he felt himself to be overly reaching in relation to good pace judgement. Simply put, his brain was telling him to lift off the gas some 20W further along than this time last year. As a coach you always want your athlete to be improving and here we can see that Michi has done just that. If he can do it as his level then you can be sure there is plenty of room for the rest of us! Finally I would say that although the 2013/2014 Cozumel files would seem at first glance to be almost identical in execution – quite a feat in itself – on closer inspection it is clear that Michi is at a slightly higher level now than he was then in terms of aerobic base development, which is what full season racing and training will do to you. But also, and this is perhaps the most pertinent point to be made here, as his sports scientist I know what power numbers represent Michi’s best effort at virtually any duration and in all environmental conditions. 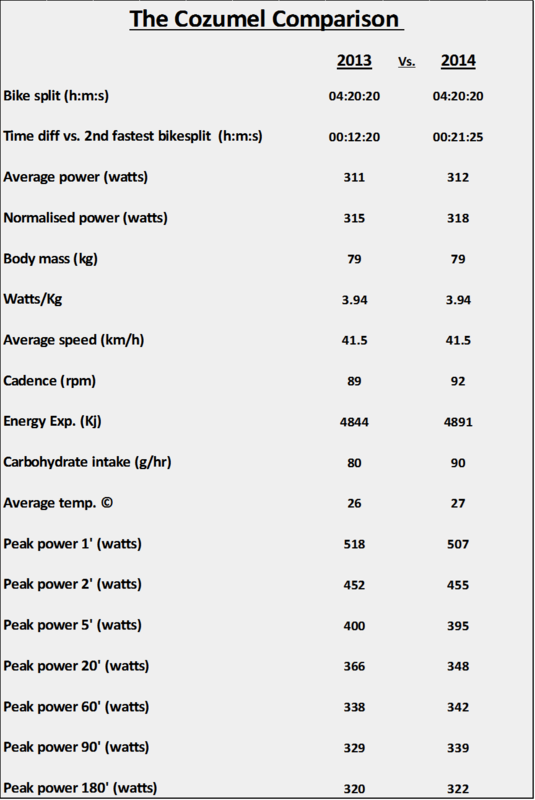 This knowledge used in conjunction with power data from every training session and race over the course of a year is an invaluable tool which allows a coach to really ‘tune’ every training session to the demands of any given race but also to the physical condition of the athlete at any given time. 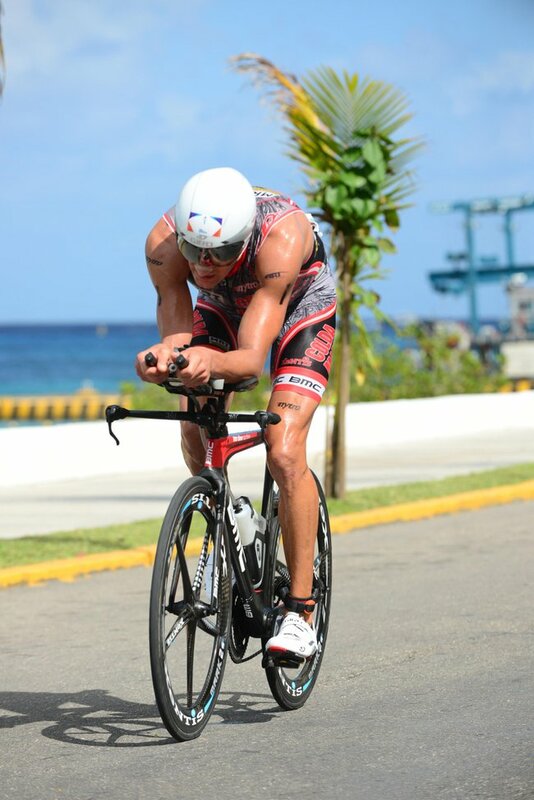 So for example, with Michi it allowed us to gauge that his heavy early season racing schedule had taken its toll and left him with a level of fatigue he still had not fully shed by the time the World Championships in Hawaii came around. He still performed extremely well but certainly a notch below what he capable of. As such, in the month leading up to Cozumel 2014 his training was changed to become primarily restorative with minimal intensity. Very different from the training he underwent in the month before Cozumel 2013 which was heavily skewed towards maximal aerobic power and was, in a word, brutal. Yet both training strategies produced almost equally excellent winning performances – As the saying goes ‘To improve is to change, to perfect is to change often’. 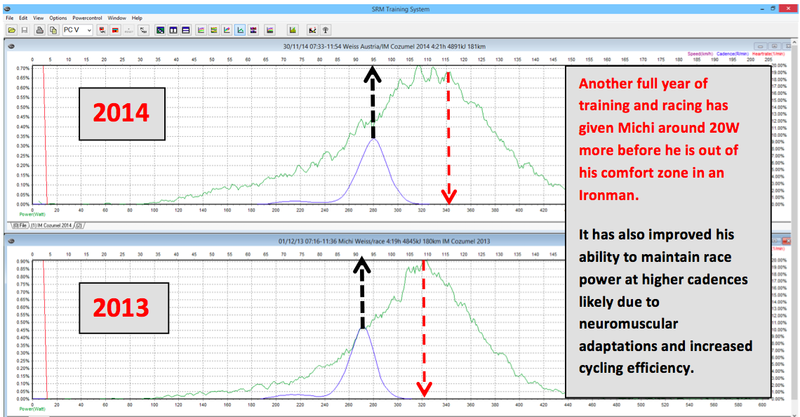 SRM training precision in action! 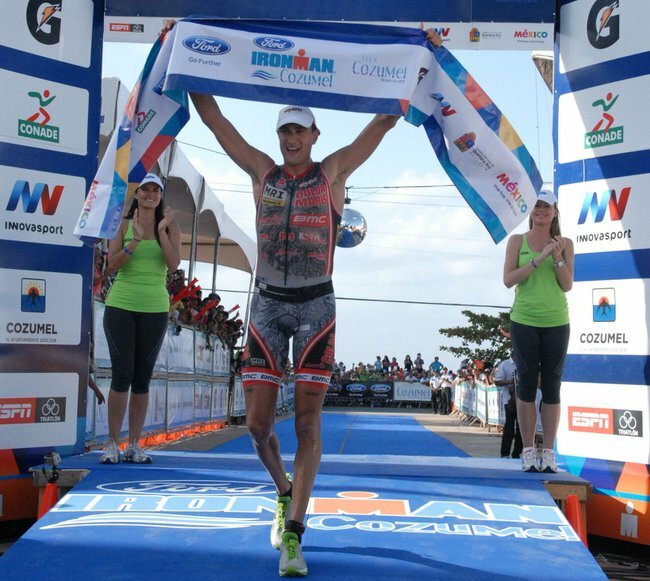 Once again congratulations to Michi Weiss on another outstanding win in Ironman Cozumel 2014 and thank you for sharing his power files for all to see, analyse, learn from.